Comes as he is expected to surrender to federal authorities. As Paul Manafort, the former campaign chairman for the Trump presidential bid, is expected to surrender to federal authorities today, the exact nature of his role in the campaign will come into question. Manafort had been a figure in Republican politics for many years before becoming a part of the Trump campaign. At his peak in the 2016 race, he had been promoted to campaign chairman. Here is a breakdown of the time he spent as an official member of the Trump campaign. 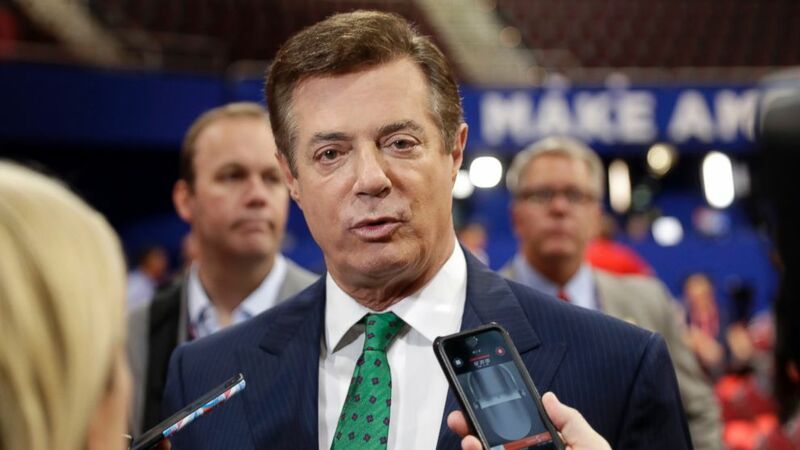 Manafort, 68, joined the Trump campaign on March 29, 2016, when he was named campaign convention manager for the Republican Party's mid-July gathering in Cleveland. Manafort was "volunteering his considerable insight and expertise because of his belief that Mr. Trump is the right person for these difficult times," a news release from the Trump campaign said at the time. "Paul is a great asset and an important addition as we consolidate the tremendous support we have received in the primaries and caucuses, garnering millions more votes than any other candidate," then-candidate Donald Trump said, as quoted in the statement. "Paul Manafort, and the team I am building, bring the needed skill sets to ensure that the will of the Republican voters, not the Washington political establishment, determines who will be the nominee for the Republican Party," Trump said in the statement. Within weeks of his coming aboard, Manafort made clear his vision for the future of the campaign. At a meeting April 16, Manafort laid out a vision for the Trump campaign that included increasing spending, hiring more staffers and redefining their roles, sources told ABC News at the time. Manafort was promoted to campaign chairman and chief strategist on May 19, effectively taking full command at that point. This move came as it became clearer that Trump was the likely presumptive GOP presidential nominee. Two days prior, on May 17, the Trump team reached a fundraising agreement with the Republican National Committee. The agreement allowed donors to write significantly bigger checks -- up to $449,400 -- to one of two committees that was established to both service the Trump campaign and the RNC as a whole. The move itself is common in many political campaigns, but it hadn't happened for the Trump campaign until Manafort was effectively at the helm. There was notable palace intrigue as soon as Manafort entered the scene because of reported tensions between him and then-campaign manager Corey Lewandowski. The drama reached a tipping point June 20 when Lewandowski was fired. Though Lewandowski didn't give a reason for his dismissal, he did say he was no longer running the show leading up to his dismissal. Lewandowski, who was hired by CNN as a political commentator days later, also spoke to the network immediately after he was fired, saying only positive things about Manafort. When asked whether his dismissal was the result of a power struggle between him and Manafort, Lewandowski said, "I don't think that's the case." (Matt Rourke/AP Photo) Trump Campaign Chairman Paul Manafort talks to reporters on the floor of the Republican National Convention at Quicken Loans Arena, July 17, 2016, in Cleveland. The shining moment for the man initially hired to wrangle delegates would predictably be the convention of those delegates. Manafort organized and directed the Republican National Convention which was held in Cleveland, Ohio, from July 19-21. Three days after the RNC wrapped up, Manafort addressed questions that had started to be raised about his and the campaign’s possible ties to Russia. "Are there any ties between Mr. Trump, you or your campaign and Putin and his regime?" ABC News' George Stephanopoulos asked on "This Week” July 24. "No, there are not," Manafort said with a chuckle. "It's absurd and there's no basis to it." In a July 31 interview on NBC's "Meet the Press, Manafort was asked about changes that were made to the Republican Party platform in the committee meetings that were held before the convention. One change that drew some attention was the softening of language on how the Republican Party treated arms deals with Ukraine and Russia, though Manafort later denied any involvement. Asked if he had any involvement in the change, Manafort said,. "I had none. In fact, I didn’t even hear about it until after our convention was over." "It absolutely did not come from the campaign," he said. The questions didn't die down over subsequent weeks, however. On Aug. 14, The New York Times reported that Manafort's name appears on a list of so-called black ledger accounts made by the since-toppled Ukrainian president amounting to $12.7 million from 2007 to 2012. Manafort released a statement that day denying any wrongdoing. The reports didn't stop there, and The Associated Press reported Aug. 18 that Manafort's firm had lobbied in the United States on behalf of the ruling Ukrainian political party even though Manafort did not disclose his work as a foreign agent, as mandated by federal law. Manafort's departure from the campaign came the next day. On Aug. 19, Trump released a statement confirming Manafort's exit and praising his work on the campaign. ABC News' John Santucci and Candace Smith contributed to this report.